State lawmakers, labor leaders and California Governor Jerry Brown today announced an agreement to enact the nation’s first statewide $15 minimum wage. The plan includes a series of annual minimum wage increases beginning next year, to reach $15 by 2022, with an additional one year phase-in for small businesses with less than 26 employees. California’s action comes less than four years after the Fight for $15 movement launched the first of a continuing series of historic strikes and protests led by fast food workers, and provides additional momentum for other states to lift their minimum wages to $15. New York lawmakers are trying to reach a similar agreement this week. State legislative leaders in New Jersey plan to pass a $15 minimum wage, and put it on the 2017 ballot in order to overcome an expected veto by Governor Chris Christie. When fully phased in, the California measure will boost wages for more than 5 million low-wage workers in the state, increase their annual earnings by an average of $4,000, and guarantee full-time workers an annual income of at least $31,000. As part of the California plan, starting in 2024, the minimum wage will be subject to annual increases based on the cost of living, and the state’s paid sick days law will be expanded to include coverage for home care workers, who were previously excluded. The $15 minimum wage agreement in California came together quickly after one of the proposed $15 statewide ballot measures pursued by labor groups was approved for the 2016 ballot last week. The ballot measure push is widely credited with creating the impetus for lawmakers to negotiate a legislative deal with the governor. Labor groups behind the ballot measure say they will evaluate the whether to continue that initiative after the $15 minimum wage legislation is passed and signed into law. Six California cities have already enacted $15 minimum wages – San Francisco, Los Angeles, Mountain View, Emeryville, Santa Monica, and El Cerrito – as has Los Angeles County. 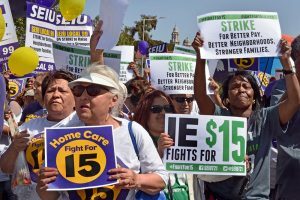 Groundbreaking new research on the effects of $15 phased-in state minimum wages, by economists at the University of California, Berkeley, showed recently that such increases will have “large positive effects on living standards” for workers and their families, with no negative impact on overall employment levels. The landmark California agreement cements $15 as the national benchmark for a strong minimum wage, and begins to reverse decades of growing wage inequality.